Global life sciences industry players see new opportunities in China, the world's second-largest pharmaceutical market, as the government pushes for innovation for a healthier country. "Six years ago, (AstraZeneca) only paid around 1 billion yuan ($148.8 million) in taxes, but now we pay 3 billion yuan as our sales have tripled," said Leon Wang, executive vice-president and international and China president of British-Swedish biopharmaceutical group AstraZeneca. The company entered China in 1993 and established its China Commercial Innovation Center in Wuxi, Jiangsu province, in 2017. "Our healthcare internet of things strategy started here (in Wuxi), and it will leave its mark across the country and along the routes of the Belt and Road Initiative, bringing benefits to patients not only in China but across the world," said Wang. Wang made the remarks during the Boao Forum for Asia Annual Conference last week. 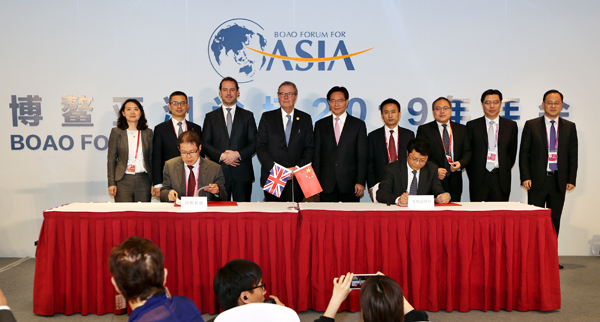 During the conference, AstraZeneca signed a memorandum of understanding with the Wuxi Hi-Tech District in support of building a Wuxi International Life Science Innovation Campus by the latter and the municipal government. The campus is designed to be an incubation innovation platform that integrates early-phase research and development, innovation, demonstrations and professional services to form a healthcare innovation ecosystem for domestic and foreign innovation companies. Noting the importance of government incentives to help foreign investors overcome barriers, Steve Bates, CEO of the United Kingdom BioIndustry Association, hopes that the campus will become an attractive place for UK companies to invest. The opportunity for UK companies, whether big or small, is they can make contributions to help China's healthcare mission, according to Bates. "We are very keen to help with some of the challenges," he said. In 2016, the State Council launched "Healthy China 2030", a blueprint aiming to improve the health of Chinese people. It plans to grow the country's healthcare industry to over 8 trillion yuan by 2020 and 16 trillion yuan by 2030. Huang Qin, deputy Party secretary and mayor of Wuxi, Jiangsu province, said the city has built a solid foundation for the healthcare industry, which can be seen by the presence of well-established pharmaceutical companies such as AstraZeneca and the Wuxi AppTec Group. He highlighted China's success over the past 40 years of reform and opening-up and said that policy support has also become more comprehensive. "Take Wuxi as an example - our GDP hit 1.14 trillion yuan last year, with the GDP per capita reaching 174,300 yuan," Huang said. Huang said the city government attaches great importance to the creation of a favorable environment for innovation, including setting up funds, protecting intellectual property, and introducing international hospitals and schools. While the government can mandate the healthcare system through new schemes, it is important for the industrial sector to step forward to make healthcare products and services affordable for people, said Ramanathan Ramanan, mission director of the Atal Innovation Mission (AIM). AIM is a flagship national innovation initiative set up by Indian Prime Minister Narendra Modi's government, under the National Institute of Transforming India. Ramanan, who is also NITI's additional secretary, said education and technology play fundamental roles in leading the success of the life sciences sector. "We hope to gather ideas across the globe to promote innovation in life sciences (in Wuxi) and bring the world's innovation to China," said Mayor Huang. "We want to build the campus together with countries involved in the Belt and Road Initiative, promoting the campus as a world-class innovation park for life sciences and pushing forward a healthy China." Wang from AstraZeneca said the BRI is not just about Chinese companies going overseas but also about foreign companies coming to China.